This is Ketchikan Joe who is growing out a top knot and modeling a great Shih Tzu Bow, perfect for a little boy. Once, Shih Tzu bows were only seen at dog shows, but that is not the case anymore. Just like people enjoy purchasing little sweaters, shirts or dresses for their dogs, the completely coordinated Shih Tzu is likely to be adorned with a matching bow. Beyond the cuteness factor, bows are very practical especially if your Shih Tzu has a long top knot or even if you are just beginning to grow out a top knot. Keep it clipped short and away from the eyes. Short Shih Tzu haircuts are usually preferred by owners who don’t have the time, patience, or inclination to mess with top knots. They want to spend quality time with their Tzu in places other than the grooming table. There is much to be said for this approach because all Shih Tzu owners know there is so much more to their dog than their hair. If you like messing with hair and enjoy brushing and combing, keeping the hair long on the head is a great option, and it certainly makes the dog look eloquent. If you are one of these peoples, a bow is a logical accessory for a top knot. The bow helps to hold the hair in place giving the top knot a little additional stability. Bows and top knots are not just for looks. All that hair that falls over the face can become a problem. When dogs drink from water bowls or eat, food particles get into the hair, and the wetness from the water bowl can keep the hair damp for hours. This creates a fertile place for bacteria to grow and stains to form. Not only face stains not attractive, but they can also harbor yeast infections. Eyes are also one of the reasons many people pull the hair back on the Shih Tzu. Loose hairs can irritate eyes causing infections and ulcers. Bows come in so many different styles, sizes, and colors that even the most discriminating buyer is likely to find a few they love. You can choose the most charming show bow to a casual one and everything in between. You’ll find bows made from a variety of materials, some handcrafted, and some mass produced. Bows can be single looped, double looped or tied. Some of the more eloquent bows also have glued on crystals, gemstones, roses, rhinestones and even diamonds. More casual bows can have just about any tiny ornament or button you could dream up from patriotic stars to little flip flops for summer bows, to little dog bones or smiley faces. Yes, boys do wear Shih Tzu bows. You will never see a male show dog without an elaborate do and crowned with a bow. While pink may not be the color of choice for your boy Shih Tzu, there are so many other colors that work well on the males including blues, greens, blacks, and reds. You can even get a bow to match your favorite holiday or purchase an assortment to complement the season. 7/8 x 1 1/2 to 2 inches. The largest bows look best on standard size dogs that have a large top knot. If you love the Pigtail look (two little topknots) then go for the 3/8 inch bow. Sometimes groomers will provide a bow for you when you get your dog groomed. Sometimes you can also find a small assortment of bows in large pet stores and small pet boutiques. The majority of variety and choice will be found online. Depending on whether you are searching for a show or everyday bow will determine where you can find a few to start your collection. If bows are not secured well in the hair, they can come loose, and some dogs will love to chew and tear them apart. This applies especially to puppies before they have become accustomed to wearing one. One way to get around this is to choose the correct size -- small or tiny bows for pups, larger ones for dogs that have a decent length to their top knot and larger bows for those with very long hair. Barrettes and clips are also used to keep hair away from the face and eyes, but while they may be easier to put on, they do not stay as well. Loose barrettes and clips can become a major choking hazard for dogs, so they are not recommended. If you do decide to go with barrettes, find ones that clip securely while still holding the hair. Before you put your bow on, you will need to draw up all the hair into a ponytail and secure it with a latex band. These too come in sizes. A rattail comb will make your job easier. You can purchase a stainless steel comb in the pet section of your favorite store, but the rattail is really the part of the comb you will use. Save some money and go across the aisle to purchase a human comb with a stainless steel tail. It works just as well at half the price. Finally, don't forget the conditioning spray. Spray the hair first before you comb or brush. 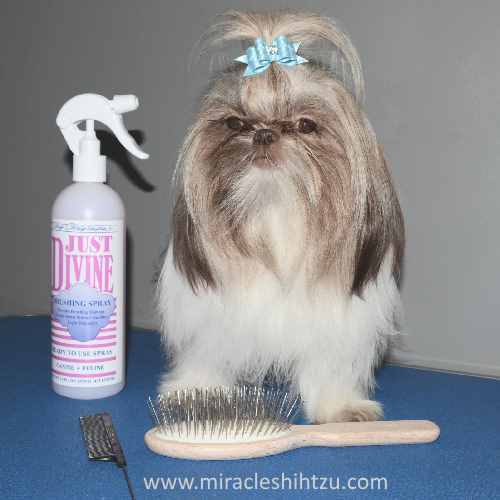 That extra conditioning will protect the hair and make putting in the topknot and Shih Tzu Bow in much easier. Chris Christensen Just Divine Brushing Spray,16 fl. oz. is my all time favorite and what I use on my own dogs.